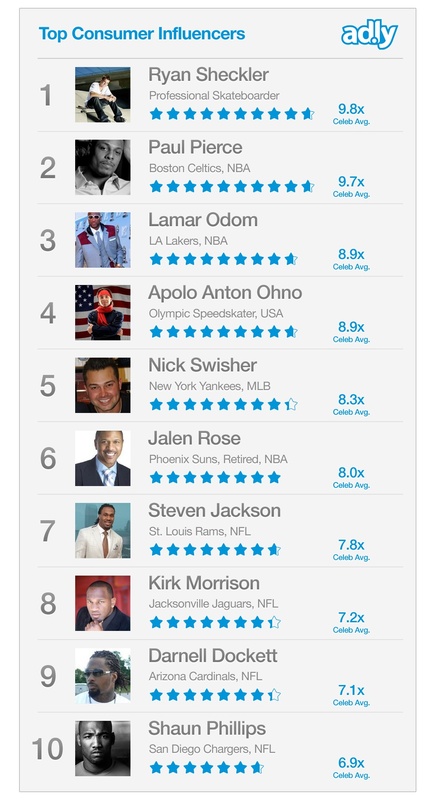 Beverly Hills, CA – May 4, 2011 – Ad.ly, which runs celebrity endorsements in social media, today revealed the top 10 most influential athletes on Twitter. According to the Q1 Ad.ly Consumer Influence Index, the athlete that drives the most consumer visits to brands’ sites is professional skateboarder Ryan Sheckler, followed closely by Paul Pierce of the Boston Celtics. Lamar Odom of the LA Lakers and Olympic Speedskater Apolo Anton Ohno are tied for third, followed by Nick Swisher of the New York Yankees. The Ad.ly Consumer Influence Index ranks celebrities in the Ad.ly Influencer Network by a variety of factors to identify the most effective endorsers over a given period of time, in a particular vertical market or a specific demographic. It uses Ad.ly’s proprietary internal ranking system to normalize performance data and establish ‘celebrity averages’ for a variety of engagement and performance indicators. The debut issue revealed the most influential celebrities on Twitter overall during Q4, 2010, including Lauren Conrad, Kim Kardashian, Khloe Kardashian, Snoop Dogg and more. Ad.ly runs celebrity endorsements in social media. It helps brands connect with consumers via the most influential celebrities, athletes and artists on today’s most popular platforms. Based in Beverly Hills, CA, Ad.ly is backed by GRP Partners, Greycroft Partners and prominent angel investors. To learn more, visit http://adly.com/.